Monique Lhuillier Resort 2014 Collection . The new Monique Lhuillier resort 2014 collection is inspired by Palm Springs and features no less than 42 fab ensembles. The designer opted for a clean line and a classy vibe with a few trendy accents thrown in. Though the pieces from the new lineup are a bit more laid back that the designer's usual array of fab dresses, but not by much. As expected, feminine vibes dominate the new line, which brings plenty of covetable elegant dresses that'll stay in your mind for a while. 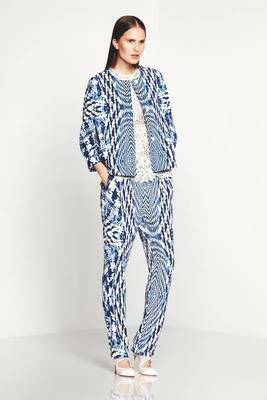 The first part of the new Monique Lhuillier resort 2014 collection confirms a suspicion we've had for a while: the abstract prints trend is here to stay. The new label brings an interesting option in the area. Though we've seen plenty of variations of the trend, creating amazing optical illusions through prints is definitely a refreshing display of creativity, which definitely puts the trend into a new light. Despite the fact classiness was always the priority in the new line, the designer didn't shy away from adding bold accents like sheer touches or bold colored leather pieces. Although laid back, versatile pieces were definitely an interesting addition to the designer's repertoire, the Monique Lhuillier resort 2014 line stole the spotlight through its spectacular cocktail dress and its classy evening gowns. This is where the designer's creativity truly came to light. For most of the cocktail dresses for the upcoming months, the designer chose rich colors and monochrome pieces, playing with proportions and textural touches for the most part. Lace and satin were the preferred fabrics for the new dresses. An interesting addition were capes which were added for a more formal vibe and to add complexity to the new look. Luxurious accents like sequins were reserved mostly for eveningwear. An impressive assortment of sophisticated strapless floor sweeping gowns and glam jumpsuits proved the most impressive pieces from the new Monique Lhuillier resort 2014 collection.